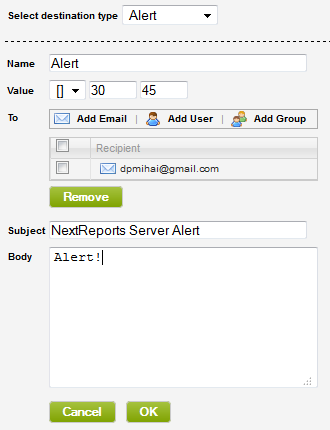 NextReports Server introduces a new feature in version 6.0: Alerts. The idea behind is that a user can be notified by email if a condition is evaluated as true. How can be this achieved inside NextReports Server? Very simple. User has to schedule an alarm or an indicator report (those reports that offer a single value at a moment in time). Instead of adding alarm or report to a dashboard and periodically look at it to see if something wrong may occur, user will schedule them in the same way as a regular report. The only difference is in the way how the result is distributed. A new destination type called alert must be selected. Alert is typically an email destination but without a "sending type". There is no link to the generated report, so the mail will contain just a simple message defined by user. Instead, a condition must be entered which compares the current value with one or two thresholds. In case an alarm is scheduled, the mail message will automatically contain, at the end, the alarm's message.